Robert Thier is a German historian, lover of old books and award-winning writer, whose novels and stories encompass the historical, satirical, and fantastical. For the way he manages to make the past come alive, as if he himself lived as a medieval knight, his inventive fans have given him the nickname “Sir Rob.” All of his stories are characterized by his very own brand of humor that has gained him a diverse readership ranging from teenagers to retired grandmothers. Besides writing and researching in dusty old archives, on the lookout for a mystery to put into his next story, Robert enjoys classical music and long walks in the country. The helmet you see in the picture he does not wear because he is a cycling enthusiast, but to protect his literary skull in which a bone has been missing from birth. Robert lives in the south of Germany in a small village between the three Emperor Mountains. It all began while Robert was writing the medieval novel 'The Robber Knight'. One of his readers misread 'Robber Knight' for 'Robert Knight', and began to refer to Rob as Sir Rob. Other fans started to use the nickname, and before Rob knew what had happened, he was elevated to knighthood by popular vote. In real life he might be a simple historian, but to his readers he has become a noble gentleman from centuries past. Sir Rob has a very sad name, although it might not seem so at first sight. His last name, 'Thier' is pronounced like the tear that runs down your face when you are crying. Attribution: The Image of the Three Emperor's Mountains was taken by Volker Gringmuth, and was taken from Wikimedia Commons. It is is licensed under the Creative Commons Attribution-Share Alike 3.0 Unported license. 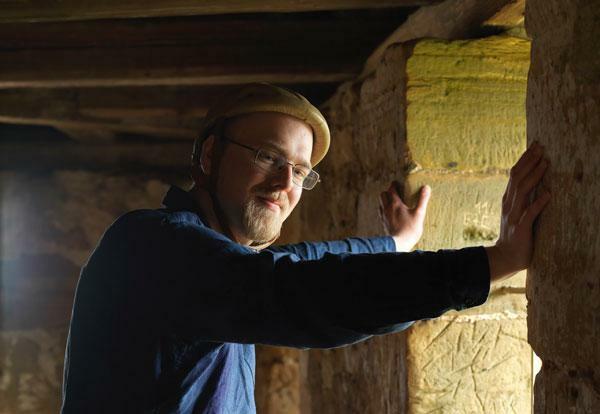 Image of Robert Thier at Castle of Rechberg taken by Cira Moro.